Families and Pizza go together like peanut butter and jelly. It’s a staple in every home! Give a gift that any family will truly appreciate with one of our pizza meal gift baskets. We have a variety of pizza gifts that any pizza lover will appreciate. But why should you choose our pizza kits over others? First, we only use the freshest, gourmet ingredients. From Rosemary Basil pizza crust to a creamy mozzarella cheese block, our gifts have what you need for the best pizza you’ll ever make. Plus, we include other toppings like olive mixes and garlic bread spread to put on the finishing touches. Also, you don’t just receive the pizza fixings in our meal gifts. In many gifts, you’ll receive kitchen accessories to help you make the best pie you can. Or, some gifts include additional gourmet snacks and treats for you to snack on while you wait. Because, while the pizza alone is pretty great, everyone loves to find other goodies when unpacking gift baskets! Finally, if you just send them a gift card to their favorite pizza place, they just eat the pizza and go. With a meal kit, the entire family can come together to make pizza and spend quality time together. What’s a better gift than making memories with those you love? Send your pizza-loving recipient one of our pizza gifts or meal gift baskets today at BisketBaskets.com. Snack Attack Plus (Pictured): Cookies? Check. Cake? Check. Brownies? Check! This gift has it all! If someone has a sweet tooth, they’ll appreciate this very sweet thank you. 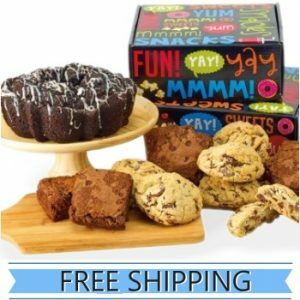 These fresh baked goods are perfect for an office or if you need to say thank you to a bigger group! Wine Country Classic Gift: Say thank you in a way that pairs with their favorite bottle of wine! This basket has all of the fixings for a lovely night in with a good bottle of wine, a nice snack, and a delicious meal. Executive Classic Gift Basket: This gift has it all. 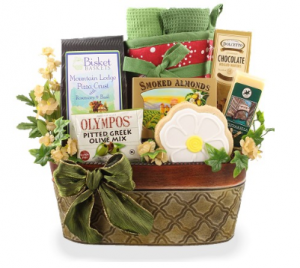 Cheeses, mixed nuts, smokes salmon, and cookies pack this gift basket for the ultimate foody way to say thank you. If you are looking for a gift that says “thank you” while making a statement, this basket is it. There are many other baskets that you can say thank you with! Just visit us at BisketBaskets.com to see all of our executive gift baskets today at BisketBaskets.com.